I got an iPad last Christmas. It is some kind of twenty-first century alchemy that I can touch an image on the screen of an electronic tablet and have the front page of the Wall Street Journal delivered to me by some unseen digital wizard. Apple sold 7 million iPads last Christmas alone (7,000,000 X $500 = $3.5 billion), which is part of the reason they have more money in the bank than the U.S. Treasury – Apple, $76 billion; Uncle Sam, $75 billion. But then Tim Geithner and company are not the sharpest tools in the shed. The screen is bright and vibrant and I turn the pages with a whisk of my index finger. The New York Times is also available with the dash of a digit, and I can load whole libraries of books and magazines into the device. Amazon now sells more digital books than paper, and airplanes these days are packed with self-absorbed travelers peering into their electronic tablets as if looking for the meaning of life. All of which makes my anachronistic love of paper books an oddity to the iGeneration. I like the feel of physical books. I like turning a paper page and the sense of seeing my books packed into the shelves of my personal library, which is jammed to overflowing with dog-eared copies of novels and non-fiction of every genre imaginable. It’s a little 19th century, but I like it that way. I suppose all of these things would fit into a digital corner of my iPad library. But where is the sense of proprietorship in that? It won’t be long, I’m sure, before Steve Jobs delivers a life-sized hologram of Julia Childs actually Mastering the Art of French Cooking right in your kitchen. But, as a touch of marketing eccentricity, I take great pleasure in perusing full-sized, paper copies of The Wall Street Journal in what is often a futile search for advertisements that communicate a message in such a way that it creates a desire for the product. Occasionally, I come across a great ad. But many are shamefully off the mark. The mind searches in vain for some understanding of how agency creative directors and corporate marketing VPs sign off on ads that omit the most basic elements of communication. They have a four-color ad in the Journal featuring a picture of a rather enigmatic man walking away but looking back over his shoulder. In the foreground is a picture of the screen of a digital tablet with a picture of a guy on a cell phone and a bunch of numbers running across the bottom. They appear to be market quotes of some kind. Eh…, I must have missed something, what “unchanging values” were those? In the smallest type in the ad, tucked in the lowest corner of the piece, we find out, if we are wearing microscope-quality reading glasses, that MIZUHO is a “global financial institution.” Maybe they think that everyone that reads the Wall Street Journal knows this. But I’m a former banker and have been a registered financial adviser and I wouldn’t know MIZUHO from Miso (fermented soybean paste), which was the first association I thought of when I saw the word. Besides the branding problem, they have a message problem: their “Unchanging Values” will help make a better world. Really? Not only do they not tell us what those values are, but the line makes one wonder if they are a bank or an environmental organization. They are a bank that specializes in Forex (foreign currency trading). Why don’t they deliver that message in their headline? 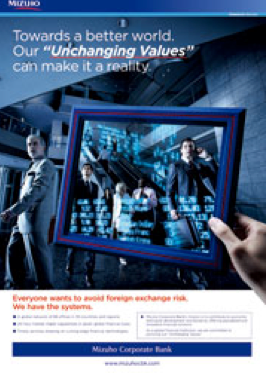 MIZUHO: A Global Bank for Foreign Exchange. Simple. Clean. Tells the story. (No charge, MIZUHO). What has buying and selling Swiss Francs and Deutsche Marks got to do with a Better World? Maybe there is an answer to that question, but we’ll never know from this ad. A final comment on the MIZUHO ad: can we replace the guy who looks like he’s a fugitive from Interpol? Same paper, same day, there is an ad that talks. Positioning, as those of you that read these articles know, ties a product or a brand to something that is already in the mind. Brands that can afford it, often use a celebrity as they already have a place in the mind. The public knows the celebrity, presumably likes the celebrity, and associates the product with the celebrity. Sometimes this works, sometimes it doesn’t. Michael Jordan, for Nike, holding an Air Jordan. No words needed. Orson Wells for Paul Mason wines: “We will sell no wine before its time. Robert Di Niro, Kate Winslet and Beyonce for American Express: “Don’t leave home without it. The right spokesperson for the right product. The point? Done right, positioning a product with a celebrity can make a stunning impression and drive sales. And here’s one where the image sends the communication without the need of a single word. The brand is tucked in the lower right hand corner. ‘There are journeys that turn into legends. Bahamas islands. 10:07′. And a website address in micro-type. But they could have skipped the tag line, in my opinion. Why divert any attention from something this good? What a coup: bagging the greatest James Bond of all time to front for their luggage. If you want to see how the great Annie Liebovitz shot it, take a look. I’ll make a confession here: I don’t have Sean Connery under contract. Di Niro either. But we have been creating great positioning campaigns for clients for a quarter of a century. So if you would like an analysis of your current advertising and marketing materials or need to improve their response rate, we are as close as your cell phone or the click of a mouse.